In the newsletter this week, we find out more about the Christmas themed parkrun events that take place this Saturday, December 22nd, another two parkruns launch early next year and holiday makers try out different parkruns at their destination of choice. 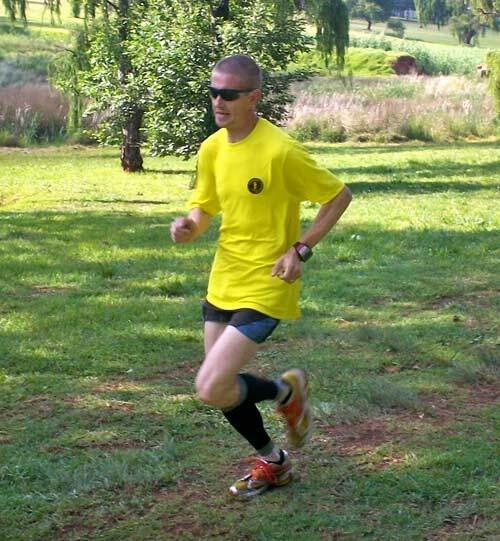 Following hot on the heels of Tracy Rankin, Delta parkrun’s Delta Dieter Meyer, became the second South African parkrunner to earn a coveted red T-shirt for completing 50 parkruns.
" 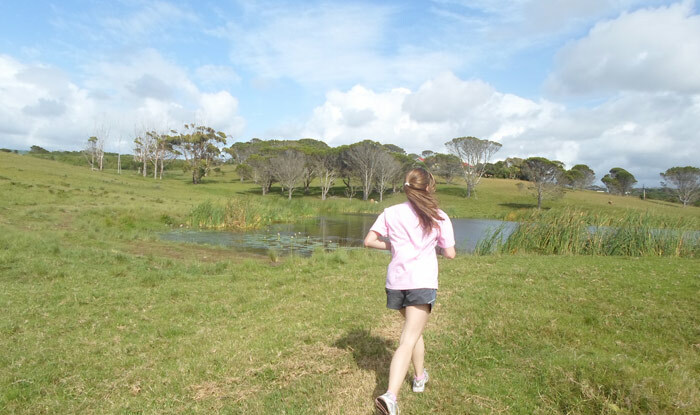 … and my tally is all home-grown, no fancy overseas parkruns for me." We suspect he was teasing Tracy who has run a number of different parkruns including a few in the UK. On the subject of running different parkruns, it has been gratifying this holiday season to see parkrunners running at other parkrun venues while on holiday. 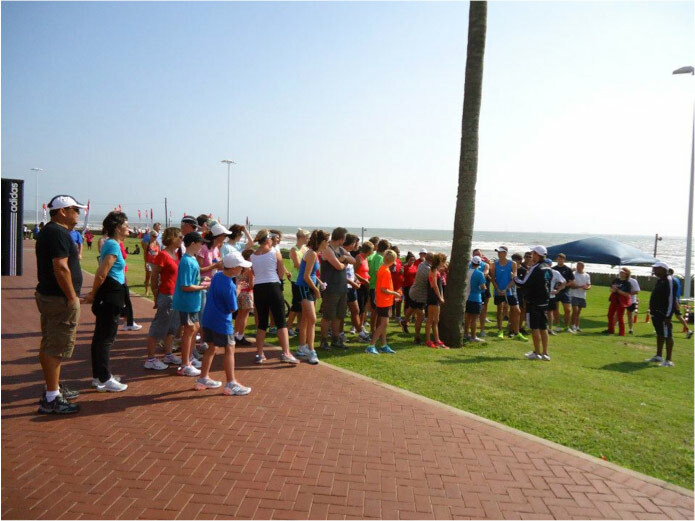 Durban North Beach parkrun found its ranks swollen last Saturday by parkrunners from the Delta, Ebotse and Roodepoort parkruns. Two Richmond parkrunners from the UK also ran in Durban. In the New Year we will add two new parkruns to our family. Both Sunrise-on-Sea (East London) and Modderfontein (Gauteng) parkruns, held dress rehearsals this week and both are raring to go. Sunrise-on-Sea will start on January 5th and Modderfontein on January 12th. Please remember to join in the fun at parkruns around the country this Saturday December 22nd, by dressing up in a light-hearted Christmas theme. Our thanks to all those who have volunteered at parkruns this year! Without you there would be no parkruns. Members of parkrun, please remember to volunteer at your local parkrun whenever you can. It may seem as if your parkrun is not in need of extra volunteers, however, I assure you that all parkruns would welcome your help. Email your local event director or me if you are willing to help. We wish all South African parkrunners happy holidays. Remember to check into your nearest parkrun while you are away. Each week at Nahoon Point we have been able to wish many parkrunners on the occasion of their birthday and other special celebrations. This week, however, sees a considerably more auspicious occasion taking place within our local parkrun community. Stephanie Ackermann, our current women’s course record holder, is to marry fellow parkrunner and regular paddler, Travis Smith. Travis has himself led the men home on one occasion and it would appear that strong althletic genes are likely to emerge from their marriage. Steph, incidentally, was the Province’s top female ultra distance runner in 2012 enjoying splendid runs at both the Two Oceans and Comrades Ultra-Marathons. We wish the bridal couple much happiness and a wonderful honeymoon. Last Saturday another couple was out adding flavour to our parkrun. Leon Botha, running as a first timer, was the first man home, while his wife, Hanlie, who is Border/Kei’s top female runner in the middle distances, carried their daughter, Danika, on her back. 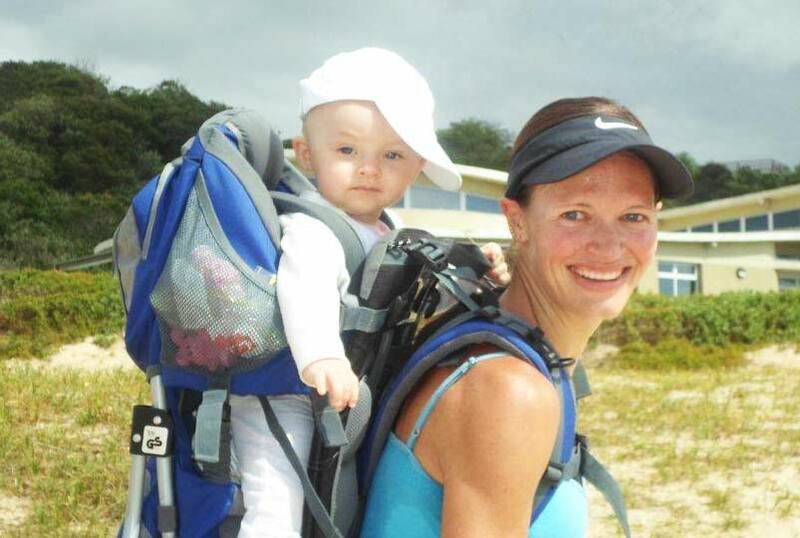 Parkrunners at Nahoon Point are waiting patiently for Danika to unleash her speedy talents through our Nature Reserve. This Saturday will be our 20th event and while many regulars have gone away, we are expecting to welcome many inland visitors to the region and to continue to have reasonable numbers at our event. Recently, we hosted runners from a number of international destinations, including Germany, Canada, UK, Australia and Ireland, while visiting local runners from Secunda, Kimberly, Bellville, Pretoria, Johannesburg and Bloemfontein have kept us on our organisational toes. We look forward to a sea of red and white Christmas elves on Saturday and wish parkruns everywhere, but especially to our fellow South Africans, a splendid turnout and a wonderful holiday season. Wishing you a happy and safe 2013 and exciting prospects in the year ahead. A trial parkrun at Sunrise-on-Sea was held this week, gearing up our enthusiastic team of volunteers and testing the parameters of the new parkrun course. We are pleased to report that it ran smoothly, hosting 30 participants in total, some of which elected to finish the course twice! A BIG thank you Gill Fordyce who coordinated the delivery of the parkrun equipment and volunteer kit and to our national sponsors, adidas and Blue Label Telecoms. We wish all parkrunners a lovely Christmas and hope to see you at Sunrise-on-Sea in the New Year. Roodepoort parkrun appealed to its participants this month to bring with them to each event, non-perishable food items for distribution to the less fortunate in the local community. To date we have received a tremendous supply of items for distribution by the Florida Parish. This Saturday, December 22nd will be the last day for the collection of your donations. Thank you all for your generosity! As part of our Christmas parkrun celebrations, Pauline Weed and her team from the Florida Running Club will provide snacks/drinks for all parkrunners after this week’s event. There will also be a prize of a pair of shoes sponsored by Randburg Runner for the best dressed parkrunner, as judged by an independent parkrun supporter. We look forward to seeing you at parkrun dressed up in your Christmas attire. We would also like to encourage parkrunners to volunteer at an event early next year. A shoe draw of only the names of volunteers from December 2012 to March 2013, will take place in April 2013. Volunteers will have as many name cards as they have events at which they have volunteered. With the Sabie X Trialrun successfully completed, local and visiting runners (and all aspiring runners) are invited to this coming Saturday’s parkrun at Summerfields. The run will start at 08h00 at Summerfields Lodge gate, which winds through the macadamia plantations and indigenous forest for a magical 5km Lowveld experience. This is Christmas Saturday and exciting prizes to the Summerfields Spa and restaurant will be awarded to the best dressed parkrunners! 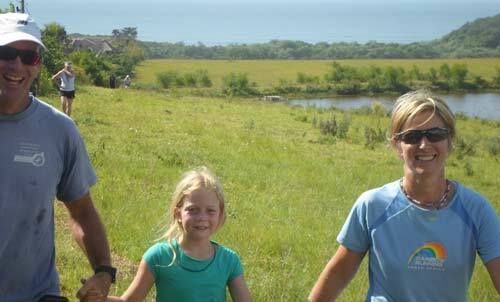 Stay for breakfast or bring the family for a picnic along the banks of the Sabie river. Shower facilities are available for your convenience. With the year drawing to a close, the North Beach parkrun has had some very welcome visitors from around the country, and the world. As expected the Jo’burgers have made a strong appearance, with representatives from Delta, Roodepoort and Ebotse at last week’s event. A record number of 81 participants took part in last week’s run, which also hosted two parkrunners all the way from Richmond in the UK, sporting their 50 parkrun t-shirts. It has been fantastic to hear that some of our local runners really look forward to our runs. One runner told us that he really missed the parkrun while he was away on business and had looked forward to getting back to his “parkrun Saturdays”. 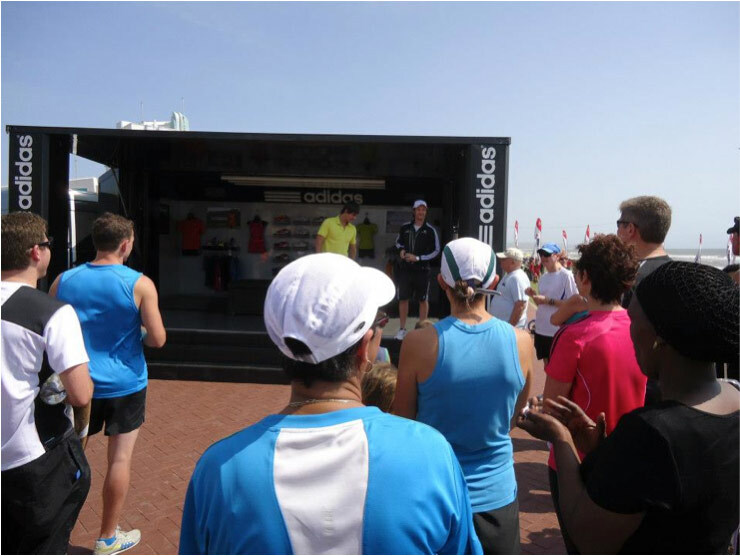 We were lucky to have the adidas van visit our last run - giving runners a chance to check out all the latest gear and shoes. One of our regulars, who has taken part in every single parkrun to date, was the winner of the lucky draw - a pair of adidas shoes! This week we look forward to Durban and its visitors coming out in force and dressed up in the holiday spirit to make this a great and memorable first Christmas parkrun. We hope to see you at the next parkrun. Thanks for the year at parkrun and a special thank you for my 50th Party and Prize-giving. It was really fantastic and much appreciated. I hope we can achieve even more together in 2013. Wishing you and your families a blessed and safe holiday and a safe return to Delta Park. Thanks for a lovely opportunity to join you on Saturday morning - it is very, very special. What do you do at parkruns: Put up flags before and take down after parkrun. How has parkrun changed your running: parkrun has given me a chance to change my running programme. It has given me a new dimension to my running. I feel running on the grass and sand paths has been a good change from always on the road. I feel even from one run a week at parkrun my legs, feet, knees and ankles are getting stronger and is helping my road running. It my only be 5km, but a tough 5km when you are racing against yourself and the clock. needs, whether you just want an easy run or a hard run. Its nice as you can still sleep in a bit, and it doesn't take up your whole day. 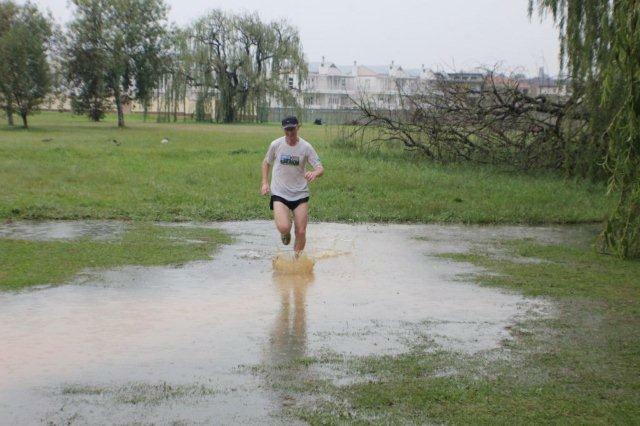 Most memorable or funniest parkrun moment: My funniest parkrun moment must of been arriving early at the parkrun when we had a lot of lighting and thunder and no one was there. Having not seen that it had been canceled. 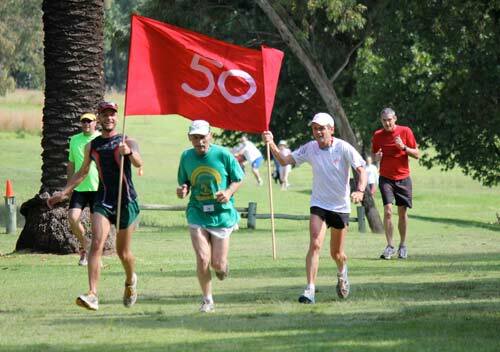 In this newsletter edition, South Africa celebrates its very first award of 50 parkrun finishes. Many of our junior runners receive their Club 10 T-shirts and rainy conditions do not deter parkrunners. Christmas celebrations are on the cards for parkrun, so look out for more information. Delta parkrun celebrates the very first South African parkrun birthday! It is scarcely believable that just over a year ago the first runners set off to run the first South African parkrun in Johannesburg’s Delta Park. 26 Runners set off that day. 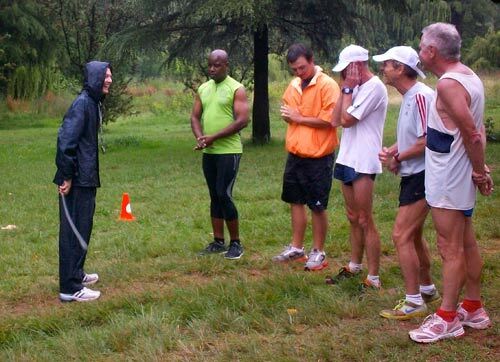 Now, Delta parkrun regularly hosts over 100 parkrunners and there are close to 5,000 parkrunners in South Africa. This number is growing steadily. Delta's anniversary celebrations exceeded all expectations. Together with all our volunteers and runners as well as our South African founders, Gill and Bruce Fordyce, we partied with cake and balloons. Gill’s sister Helen baked delicious chocolate brownies. In celebrating our birthday, we did not forget our sponsors, Blue Label Telecoms and adidas – without whom none of this would have been possible. Innocent Ndlovu was the monthly prize winner. For his prize, he was invited to choose a pair of shoes from the adidas display which had been set-up for the event. The very first outh African annual point’s competition winners were Tracy Rankin and Dieter Meyer. What dedication and enthusiasm! Two weeks after our party, Tracy earned her red club Tee for completing 50 parkruns and Dieter will earn his in two weeks time. The very first club Tees were awarded to various junior parkrunners. 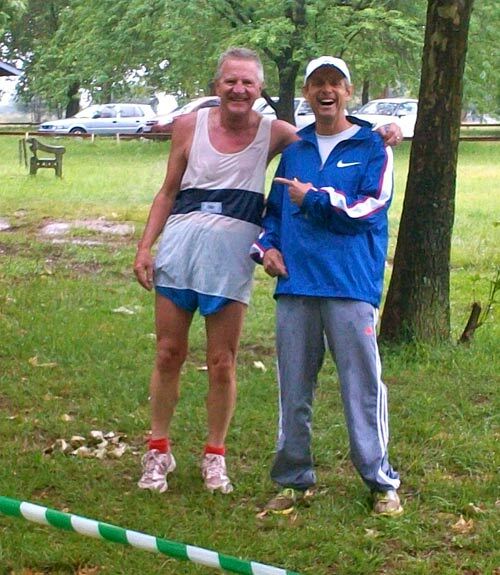 At Ebotse parkrun, Micaela Goncalves received her white club 10 Tee from Bruce Fordyce. Our picture shows a delighted Tracy Rankin receiving the congratulations of fellow parkrunners as she is awarded her special Tee shirt for becoming the first South African to run 50 parkruns. In other Delta Park news we are happy to report that, the Spotted Eagle Owls are back and just like last year, mom and dad have raised three chicks. The owls have taken up residence in the Willow tree near the start. This is a must see for the nature lovers and bird-watchers. For those going on holiday this festive season we have established parkruns in East London, Hazyview and Durban, with further parkruns to commence early in the New Year in Cape Town. Next year the South African parkrun family will grow considerably. Our aim is to create at least 20 parkruns around the country. For more detailed information please look at our website. We will celebrate Christmas at all our parkruns with a dress up festive season run on 22nd December, the Saturday closest to Christmas Day. We would love to see Santa, fairies and reindeer prancing around the course! More on the Christmas run in the next newsletter. Robyn Kaltenbrunn flew around the challenging course to set a new record time of 20 minutes 11 seconds. She also finished second overall, a fantastic achievement for this talented 15 year old. 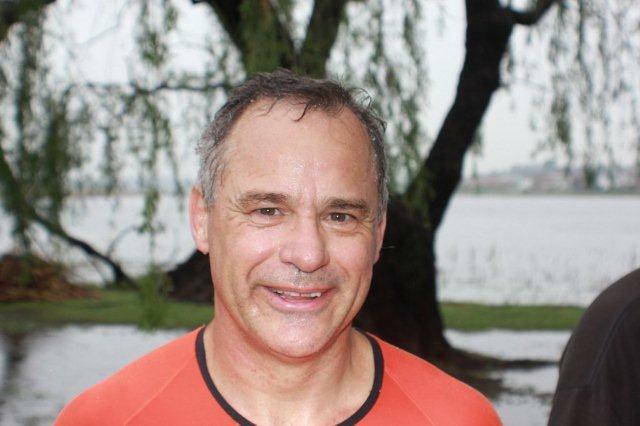 Despite the heavy rain that lashed the parkrun on 24 November, Gary Jackson ensured that the efforts of all who braved the wet conditions were recorded. Ebotse is the preferred place for hundreds of Barn Swallows that migrate 13,000 kilometres to escape the European winter. We were also pleased to host some human visitors from the UK in the form of Bev Williams and William Abrie. It’s a pity that William decided to bring the UK weather with him as his visit coincided with a deluge of rain. Bev provided motivation for many with her 50 club Tee shirt. Durban is finally creeping out of its extended winter and rainy period and is heatingup just in time for the festive season. We think that the heat may be contagious to our North Beach parkrunners. “Why is that?” you may ask. Well, we have had some blistering fast times over the last few weeks with records being shattered and personal bests being achieved. We are truly lucky to have such an amazing venue – a wide flat promenade (at sea level) with an amazing view and atmosphere. The outstanding achievements over the last few weeks have mostly been dominated by the ladies. Our female course record was broken last week which also means that we have a new South African female record holder. Debbie Perry who came in with a time of 18:49 minutes has now taken over the title of the fastest female parkrunner in South Africa from Sarah King who previously held it with 19:42 minutes. But the men are also doing their bit with a new course record set at 17:30 minutes by Reece Allard. Will we see a new record anytime soon? We may even have a few challengers from Joburg or anyone else holidaying in Durban over the Christmas period. We hope to see you at the next North Beach parkrun. On the 24th of November, Roodepoort had a record lowest turnout to date! It was not surprising due to the unfavourable weather conditions and the fact that the very popular race, "The RAC 32km Tough One" was taking place the following day, that only 6 brave, drenched and running-addicted individuals gathered for the 8 a.m. start. Interestingly enough, this event serves as a case study to prove that males are definitely more stubborn than their female counterparts, as all the runners were male! Despite the miserable rain and chance to rest up before Sunday's big run, David Colloby's means of transport to parkrun was his own two legs. Yes, he ran in the pouring rain to participate in a 5km run, only to run home again afterwards. What dedication. Your 50 T-shirt will be worth it Mr. Colloby! A big thank you to the Roodepoort parkrun volunteers for your continuous support! Volunteers at Roodepoort parkrun have decided to appeal to our runners to bring donations of non-perishable foods to the events. These will be collected and given to a local church for distribution to the needy in our community for Christmas. Please feel free to bring your donations from now until the 22nd of December. Finally, we have an opportunity to have a bonus parkrun event on 31 December to see the year out. If we have a big enough response, then we will go ahead with an old years eve run at 5 p.m. Please email us or drop us a message on Facebook with your comments. Last weekend Summerfields' parkrun was set alight by Tukkies athlete Gerhard de Bruin, when he blitzed round the 5 kms in 17:55. The course is quite technical with a number of single tracks through the natural forest, together with one or two nasty uphill sections. These did not deter the professional triathlete from setting the bar very high for prospective recordholders. Gerhard was visiting Summerfields as part of his build-up towards the SpecSavers 70.3 Iron Man event in East London on the 20th of January. Look out for him at the Nahoon Point parkrun on the 19th of January! The regular Summerfields parkrunners continue to improve their times, despite rainy days and muddy tracks. Last week Craig Thomas, Chris and Christiaan Smit all ran PB’s in pelting rain. Well done guys! December promises to remain wet, yet its never cold. All parkruns will continue throughout the holidays. We only cancel due to violent thunderstorms or other events taking place at the venue. See you on Saturday at 08h00. Two weeks ago we were excited to have 295 finishers in warm, if somewhat windy conditions and a week later, in admittedly miserable wet and cool weather we had 99. It would have been easy to blame the 10 and 5km race taking place just two kilometres away, but the previous week there was a 10km race 3km up the road. Most of our races are on Saturdays which is strange given the traffic situation as opposed to that of a Sunday. 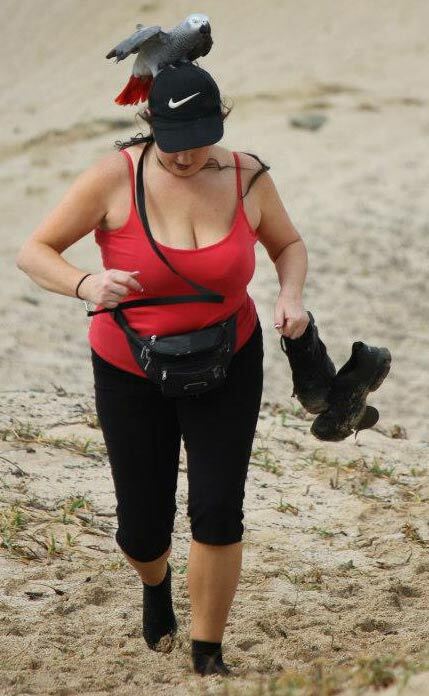 As it happens, to have 300 folk participating in the Nahoon Point Nature Reserve on one day is probably detrimental to the dunes and trails. With this in mind and the prospect of even bigger fields during the summer months, a new parkrun will be launched some 25km up the coast on 5 January at the small village of Sunrise-on-Sea. Our Nahoon Point community has proved to be a special one and being at parkrun each week has been most pleasurable for all the regular volunteers who pitch regardless of the weather. We have two men who have run all 17 of our events to date and the pressure is on to see which of Oliver Ive and Gavin Giblin will falter first. Three young parkrunners have qualified for their Club 10 T-shirts. We extend our congratulations to Henke Ackermann, Taryn Hensburg and Ryan Owen. With the holiday season upon us, we look forward to welcoming parkrunners - established or new - from around the country. You are unlikely to run a PB in our special reserve, but you will be blown away by the views. Visit our Facebook page to whet the appetite. Irwin and I would like to thank you for the awesome work you are doing. parkrun #29 was our first and we thoroughly enjoyed it. We would like to help as volunteers in the future. Please keep us posted. Hi Bruce, Marie-Claire here, from Nahoon point. My daughter is going to California for a month and is keen to do a parkrun there. I have looked and don't see any in that area. She got in with a Rotary Study Group Exchange ,(teacher) and mentioned parkrun in her speech on why she likes South Africa. Bruce: Hi Marie-Claire. Unfortunately there is only one parkrun in the US and it isn't in California. Tell your daughter "thanks for the mention"